Glasses take some getting used to and can be very uncomfortable especially for a child. Stop spending tons of money replacing broken or lost eyeglasses. Ava & Kings' 6 Pack of Neoprene Kids Glasses Holder Strap Eyeglass and Sunglass Retainer helps to make your child's glasses more comfortable and easier to wear. 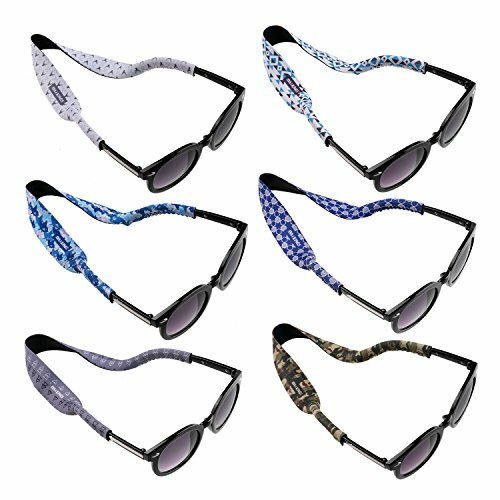 Ava & Kings' special toddler neoprene glasses strap will hold your child's glasses and help prevent them being misplaced. Accidents happen, and if their eyewear gets pulled off, these holders will allow your child's glasses to hang from their neck. These simple eyeglasses accessories for kids come in a pack of 6, so you can attach them to extra pairs of glasses or sunglasses. Simply attach these glasses holders to your child's eyewear by pushing the arms of the ear pieces into the ends of the straps. Put the glasses onto your child's face and ears, then pull the strap around their head. Each kids and toddler eyeglasses and sunglasses retainer strap comes in a unique, fun, and colorful design that your child will love. Made with high quality, soft, stretchy neoprene, these glasses strap sports kids love are comfortable and quick-drying. At 14 inches long, each eyeglass & sunglass strap will fit most children ages 4-10. The head and neck strap measures out to about 10 inches long and stretches comfortably around your child's head. The earpiece holders are about 2 inches long on each side and will attach snugly to most types of children's glasses. Your child will love to wear these straps on their glasses to keep it from slipping off their face while running, jumping, and playing sports. Perfect for Children's Eyeglasses or Sunglasses! Your child will love to have their glasses with strap at: School, Field Trips, Sporting Events, Beach, Pool, Playground, Day Care, Parties, and more! Choose from Sets of 6 for Boys or Girls! If you have any questions about this product by Ava & Kings, contact us by completing and submitting the form below. If you are looking for a specif part number, please include it with your message.